Unknown faces look out at us from the postcards, we sometimes have a name but it doesn’t always help in finding out about their lives. 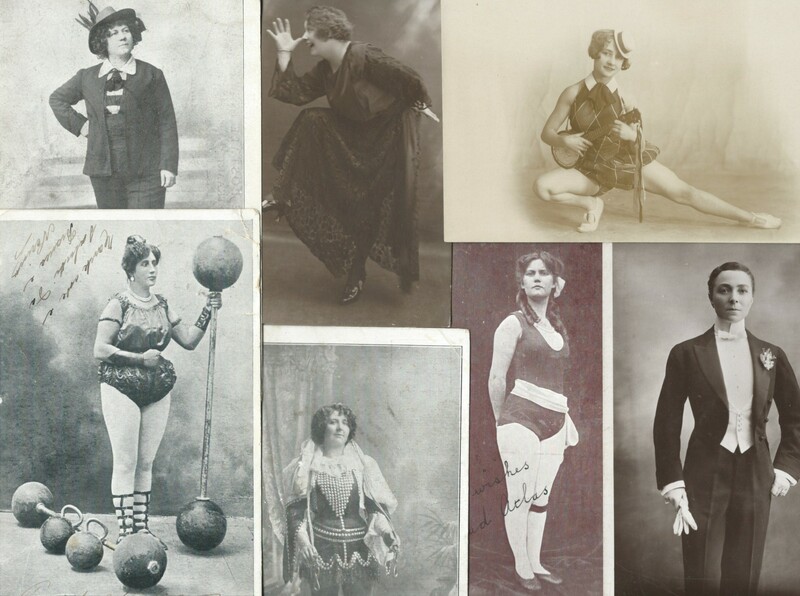 These women and young girls took up eccentric dancing, boxing, diving, mimicry to make a living on the halls. It was hard, travelling round the country, often appearing in dingy rooms at the back of drinking establishments where the audience were not shy of expressing their opinion of the artiste. It was a bad idea to appear just before a popular performer if you had a weak voice or your comic turn was not funny. The audience just wanted to see their favourite. 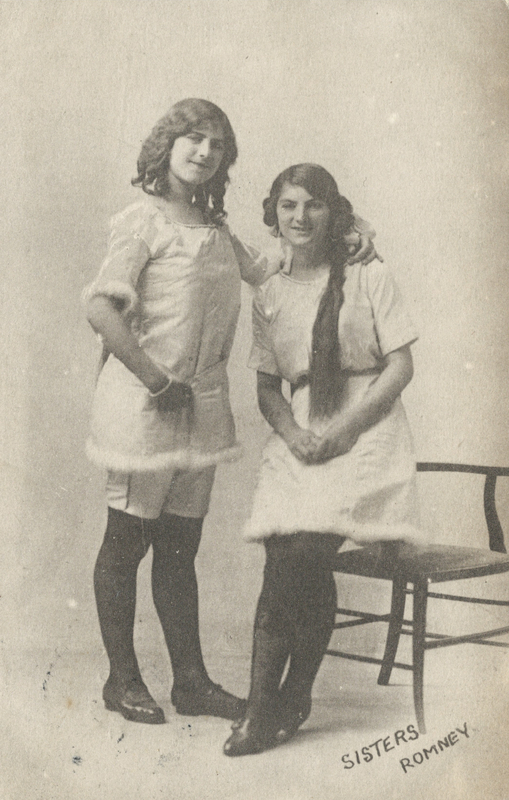 I have a postcard of the Sisters Romney sent to Mrs Johnings in Canterbury on 28th October 1914, not long after the start of the First World War. 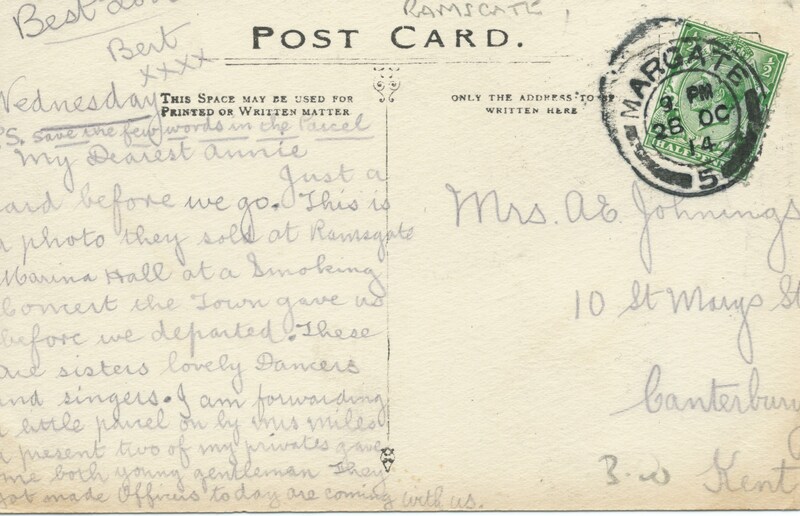 The sender, Bert, writes that he saw the Sisters at Ramsgate Marina Hall at a Smoking Concert held by the town for the soldiers before they departed. He describes them as ‘lovely dancers and singers’ and as sisters, although they could have adopted this as part of their act. The back of the card is a poignant reminder of ordinary lives. Click on the card to read the message. This entry was posted in First World War and tagged Sisters Romney, Smoking Concert on January 30, 2015 by Monomania.